The Search / Compare command finds differences in two files or streams. The primary stream is always the stream that is open in the current window. The secondary stream, that is the stream to be compared with, may be a file, or a logical disk, or a physical drive. If you wish to compare with an alternate stream, add the colon character and the stream name to the file path string, for example C:\Temp\file2.dat:auxdata. You can compare streams in whole or partially. If you wish to compare only parts of the streams, check the Block Comparison box and enter the starting offsets and sizes of the blocks to be compared. Leave the offset field empty to compare starting from the lowest address (always 0 for file system objects); leave the size field empty to specify the rest of the stream. You can see the Comparison Map in the left part of the window, the Comparison Pane in the Navigation Panel, and both the files in the split main window area. 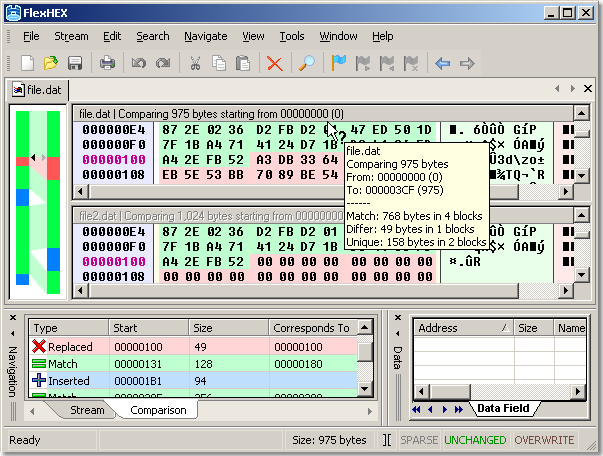 The secondary stream (shown in the lower part) is open in the read-only mode and cannot be modified. Except this you can handle it as any other open file – place bookmark, define data fields, select and copy blocks of data, and so on. 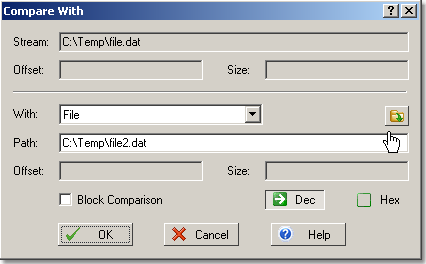 Selecting the Stream Pane switches the main window to the standard one-file view without discarding the comparison result. Selecting the Comparison Pane switches the window back to the split two-file view. Other Navigation or Data panes don't affect the current view. If the file header is printed in red, this means that one of the files has been modified, and so the comparison result may not be valid. Use the <Compare Again command to update the comparison results. The current FlexHEX version does not track change made to the secondary stream in the other edit window or by another application.